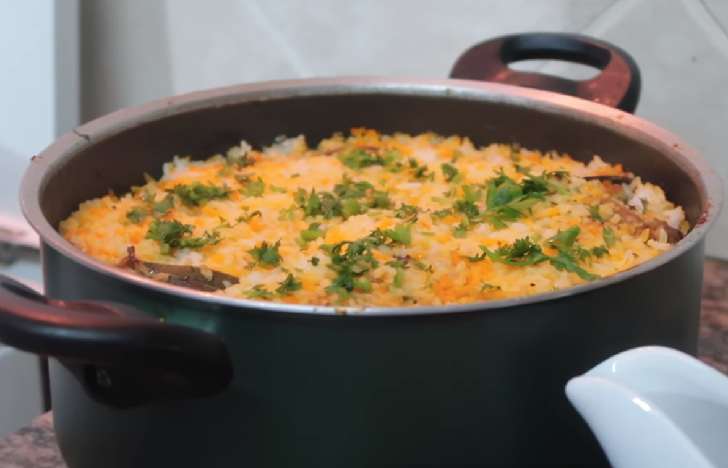 This is a delicious Pakistani/Indian rice dish which is often reserved for very special occasions such as weddings, parties, or holidays such as Ramadan. It has a lengthy preparation, but the work is definitely worth it. For biryani, always use long grain rice. Basmati rice with its thin, fine grains is the ideal variety to use. Ghee is butter that has been slowly melted so that the milk solids and golden liquid have been separated and can be used in place of vegetable oil to yield a more authentic taste. ☛1.5 kg chicken (remove skin). ☛4 cans of crushed tomatoes (8 to 10 tomatoes chopped and blend). ☛2 small cans of tomato paste. ☛A teaspoon of ginger and garlic paste. ☛1 tablespoon of Ghee butter (or cooking oil). ☛¹/₂ glass of plain yogurt. ☛3 cups of basmati rice (for 6 people). ⏩Prepare your chicken (I used 1.5 kg), remove the chicken skin then add a teaspoon of ginger paste, garlic paste and 2 to 3 cubes of Maggi. ⏩Add water to the chicken level. ⏩Boil the chicken a bit. Do not cook the chicken all the way because it will continue cooking in the biryani sauce. ⏩When the oil starts smoking, Add your chopped onions. Brown your onions. ⏩Heat 6 tablespoons of cooking oil. ⏩Add your crushed tomatoes. I used three medium tins. You can use 8 to 10 chopped and blended tomatoes. ⏩Stir to blend the tomatoes and the crushed tomatoes. ⏩Add in a small can of tomato paste or 2 tablespoons. ⏩Stir and let it cook for 2 to 3 minutes. ⏩Add your spices, teaspoon of garam masala, biryani masala and ¹/₂ teaspoon of Curcuma. ⏩Add 1 teaspoon of coriander powder, 2 to 3 cubes of Maggi, salt to taste. ⏩Stir and cook for a few minutes covering with a lead because the sauce keeps splashing. You will know that the sauce is ready for the chicken when the oil starts coming up. Please make sure the sauce is well cooked before adding boiled chicken. This is to make sure that the tomato sauce and the spices are well cooked. If the sauce starts sticking on the bottom of the cooking pot add some cooking oil and stir. ⏩Add the drained boiled chicken. Do not add the chicken stalk in the sauce. Keep it and use it for other recipes. Stir. ⏩Stir from time to time to avoid sticking and burning and let the chicken cook until very soft. ⏩Remember to keep the lead on while cooking. ⏩Add the boiled eggs and cook for a further 5 minutes. ⏩Add the chopped mint and coriander and put off the heat. Mix well and set aside. ⏩Soak the rice for at least 30 minutes. ⏩To cook the rice, pour water into a large cooking pot. (put any amount of water as long as it completely covers the rice. There is no need of measuring water since the rice is only pre-cooked in this water, then drained. The rice is baked until fully cooked.) Add green cardamoms, cinnamon and star anise, 1 tablespoon of ghee and salt to taste. ⏩Boil eggs (boil the eggs for 8 minutes only since the eggs will continue cooking in the Biryani sauce) then cool them and peal then set aside. ⏩Add the soaked rice in the boiling water, let it cook for five minutes. Or until the water starts bubbling again (drain the rice as soon as you see the first bubbles of boiling.) Do not cook the rice all the way. ⏩Mix your food coloring with milk, I only used ¹/₂ a teaspoon with ¹/₂ glass of milk. You can use water if you wish. ⏩Sprinkle the food coloring mixture randomly on the rice. At this stage don't mix the rice until it's completely cooked. ⏩Cover the rice with foil. ⏩Bake at 170°C for 35 minutes. After 30 minutes, remove the foil and let the rice cook for the remaining 5 minutes. ⏩Remove the rice from the oven and delicately mix with a big spoon to evenly spread around the Orange and White rice. Garnish with fresh coriander leaves and serve. Enjoy!